How to Plan Your Wedding With Ease: My 3 Secrets! As a busy bride-to-be, you know how overwhelming it can be to plan your wedding. You’re already trying to juggle work, your hobbies, and time with your partner, friends, and family! Have you ever wished it were easier? And that you could follow a tried-and-true method for getting everything done in the right order with the least amount of stress? Believe me, I know just how you feel! When I was planning my wedding last year, I felt incredibly overwhelmed. I’m super organized, but I’m not an event planner! And I didn’t know where to start. I wasted countless hours on Pinterest, mindlessly scrolling through color schemes and dress silhouettes. And I spent forever looking for wedding planning templates and the answers to my many questions. I often felt lost and confused. The pressure to plan the perfect day kept me up at night, and I kept worrying I was forgetting something important or leaving things out altogether. While this was supposed to be one of the happiest and most exciting times of my life, I couldn’t fully enjoy it. I wondered why I couldn’t just enjoy wedding planning like all the smiling brides on Pinterest. It was like something was wrong with me. I knew something had to change. And I took a few critical steps that changed the trajectory of my wedding planning journey. In today’s blog post, I’ll share some of those with you, as well as an opportunity to take advantage of my learnings to short-circuit your own planning process. Secret #1: Craft a Wedding Day Vision. As you’re planning your wedding, it sometimes feels like the possibilities are endless. There are so many opportunities to buy more things or hire more vendors, which can distract us from what’s most important. Most of us want our wedding day to be meaningful and to reflect the goals and values we share with our partner. But not all of us know how to get there. All it would take is a few minutes on Etsy for me to decide that I simply HAD to buy Bridesmaid Proposal Kits, a personalized “Mrs. Irwin” phone case, or 3 different types of wedding favors. And browsing potential vendors on Wedding Wire almost convinced me that we needed to rent a classic car for photos. While all of these things have a time and place, they didn’t line up with our wedding vision, and they weren’t part of the budget. And getting distracted by shiny objects was a waste of time and energy, taking me off track from planning an intentional wedding. That’s exactly what Wedding Planning Made Easy is all about—a guide to help you plan a meaningful wedding that is a true celebration of you and your partner starting this next chapter of your lives together. In fact, there’s an entire module about setting your wedding vision as a couple And we refer back to it often throughout the course to ensure your plans are staying track. When it comes to planning with intention, I recommend starting by reflecting on what has meaning to you. By asking yourself some key questions about the pillars of your relationship, the culture and traditions you hold dear, and your personalities as individuals and as a couple, you can gain tremendous clarity on what values and themes you want to guide your wedding day. Looking for some thought starters? My post How to Plan Your Wedding with Intention has you covered. The key then is identifying the common threads and finding ways to make these components shine. When you are so busy juggling everything, it can be hard to see the big picture. But it is exactly that bigger picture that will help you plan with confidence the wedding of your absolute DREAMS. Secret #2: Get Clear on What You Have to Do and When. According to a recent study by Zola, the most stressful part about wedding planning is simply getting it all done. And I can totally understand that. There’s so much to do, with additional tasks piling up over time. And what’s more, it’s tough to know what to prioritize at which stage, since everything feels new. To zap some of your overwhelm, the key is to first get clear on what components you’d like to include in your wedding day. And then, to make a comprehensive, prioritized list of everything you need to accomplish with timelines. By creating this task timeline, you’ll be able to focus on the right things, always be working on the most important tasks, and avoid letting any details slip. The timeline I created for myself ended up being like GOLD. I referred to it almost daily and it’s a big reason our wedding went off so smoothly. In fact, I’m such a believer in this that I’ve created a pre-populated Wedding Planning Timeline Template that I offer in Wedding Planning Made Easy so that you don’t have to start from scratch! By having a concrete roadmap to follow, you’ll spend way less time doing mindless tasks, and more time acting deliberately. This means fewer hours spent planning your wedding, which is a win! Secret #3: Look for Smart Ways to Save Money. One of the biggest planning challenges is the sheer cost of a wedding. In fact, according to The Knot, 45% of brides surveyed spent more than they’d planned by an average of… wait for it… $7,319. Budget issues can cause disagreements, put couples into debt, and make them feel like they’re “missing out” by not being able to afford everything on their list. So it’s fair to say that finding ways to cut back on wedding costs can make a big difference. If I could give one piece of money-saving advice, it’s to opt for non-wedding things wherever possible. For example, could you have a regular cake made that’s not a “wedding cake”? Could you get a regular limo package instead of the “wedding package” that up charges for things you may not need? Can you get a generic guest book versus only shopping from wedding guest book vendors? The wedding industry is notorious for charging a premium because they know most couples will pay it. But if you’re a savvy shopper, you can short circuit parts of your planning to avoid this and put more money back in your pocket. My post How to Plan an Affordable Wedding has more tips to consider, but the Wedding Planning Made Easy Course goes into much more detail about ways to save money with every vendor and on every major wedding expense. Also, by forgoing hiring a wedding planner and doing it yourself (with the help of a course! ), you can save yourself several thousand dollars. What would it feel like to, armed with strategies like these one above, be completely confident planning your big day? How would your life be different if you could save yourself hours planning your wedding? What would it look like if you were able to be much more deliberate with your time? 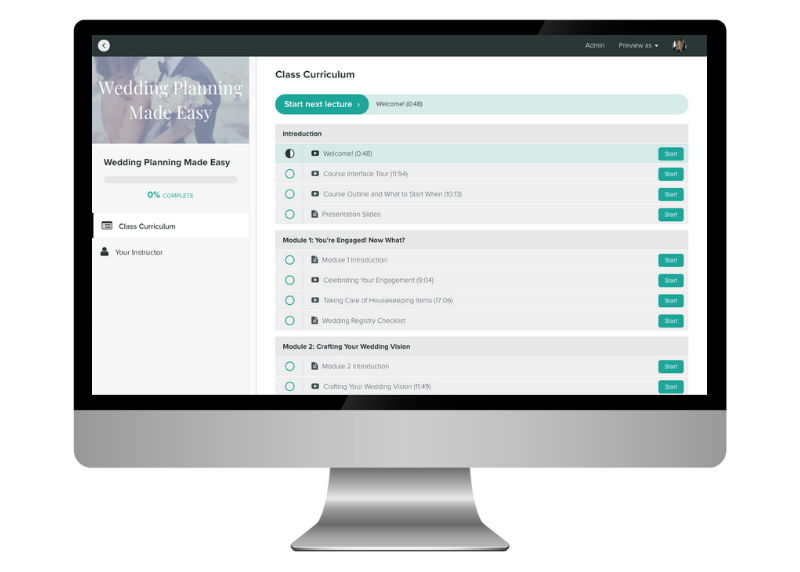 I’m so excited to introduce Wedding Planning Made Easy. It’s a self-paced course for busy brides-to-be. And it will help you create the wedding of your dreams with confidence and ease. The course consists of a whopping 10 modules. They walk you through everything from housekeeping items to tackle after getting engaged all the way through to nailing the final month leading up to your big day. Wedding Planning Made Easy is video presentation style, with over 5 hours of video content. Not only do I present the materials from the slides, but I also add in additional tips and examples from my own experience. You’ll also receive 17 worksheets, printables, checklists, and templates. I specifically designed these to help you put the theory into practice and make your plans come to life. For more information about the curriculum, check out the information page. Busy brides-to-be, or really any bride-to-be who isn’t familiar with planning a wedding and is looking for guidance. It’s also for brides who are trying to avoid spending $3,000+ on hiring a dedicated wedding planner. The investment for Wedding Planning Made Easy is only $147USD. That’s about 5% of the average cost of hiring a wedding planner. It’s your turn to feel confident (and dare I say, excited?!) to plan your wedding day. You know you have the skills to plan the perfect wedding, you just need some guidance. Given how important the day is, you want someone to hold your hand every step of the way. You don’t want to miss any details, but you’re hesitant to spend thousands of dollars on a planner. And you don’t have the patience for figuring out every little thing on your own. 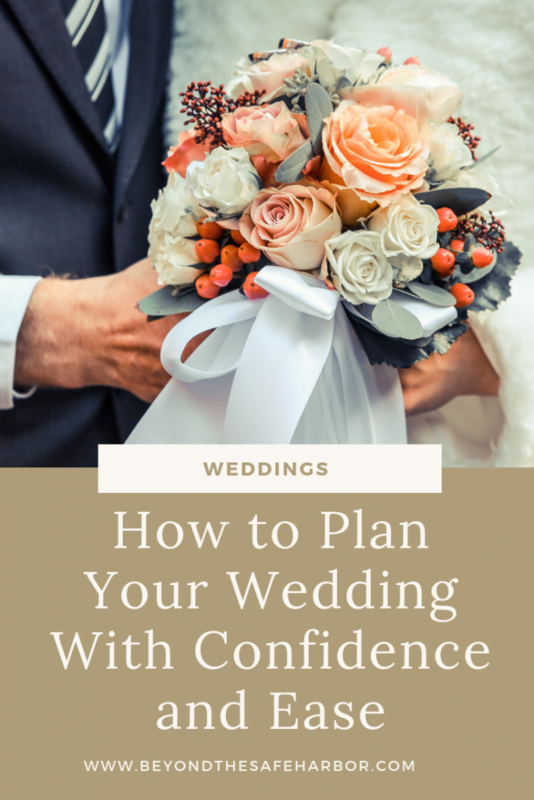 I hope these tips help make your wedding planning process more easeful. If you have any questions at all, please leave them in a comment below, or contact me. I’d be happy to help!